I have always liked foods with little ingredients. It spells SIMPLE and UNCOMPLICATED and TIME-EFFICIENT and FOOL-PROOF to me. That's just my alley. Because deep in my heart I think I am a peasant. I like cakes made with 3 ingredients. 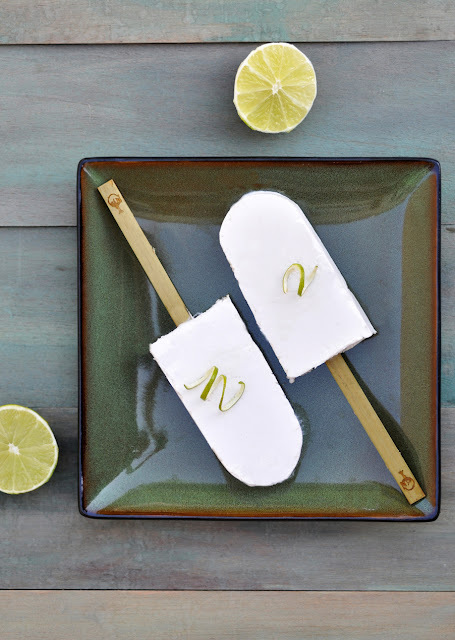 Now here is another one with just three: Coconut Lime Popsicles. If I had an ice cream machine, it would probably make the most delicious and exquisite ice cream. But I don't (because I am a peasant at heart?). I only have popsicle molds. These popsicles were a trial and error recipe. I started of with just coconut milk and honey (how cool would have been just two ingredients!!! ), but found those a bit on the heavy side. Something acidic was missing. Now what would be closer than using the old classic combination of coconut and lime. I have only made a couple of times, but I know this will be a staple dessert in our house. Simple and healthy and nevertheless a dessert. What else could one wish for? Place the can of coconut milk in the fridge overnight. Without shaking or turning the can upside down, open the can and scoop the top layer of coconut cream into a bowl. Discard the water at the bottom. Stir in honey and lime juice until well combined. Transfer mixture to popsicle molds and freeze until solid.